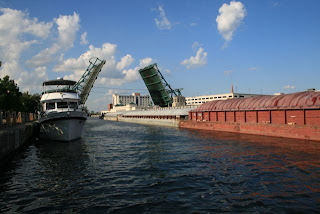 We were excited to see the tows because of course Dragonfly is a canal boat, our home port is the Erie Canal, and that was the whole premise, back when the Erie Canal was opened in the 1820s: A big, flat-bottomed boat can carry a whole lot of stuff, cheap. 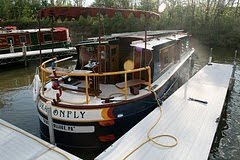 Pulled by two mules, the original canal boats were slow--but keep 'em moving, 24 hours a day, 7 days a week, and they cover a lot of ground. The premise still works today. 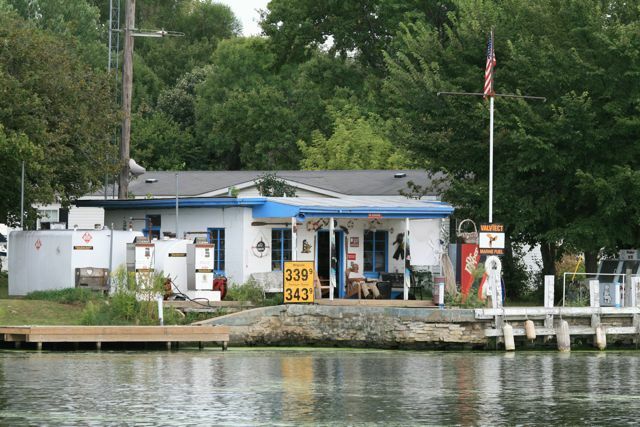 Our current boating "Bible" is Cruising Guide from Lake Michigan to Kentucky Lake, the Heartland Rivers Route by Captain Rick Rhodes. Cap'n Rick includes a handy little concise chapter on towboats at the front of the guide, so recreational boaters will know how to deal with them safely and appropriately . . . which is good, because the first time you see a tow moving slowly and inexorbably toward you round a bend in the river, so enormous it exerts the gravitational pull of Jupiter, your untrained reaction is to freeze in absolute terror. But remember, big = good. Here's what I learned from Cap'n Rick. 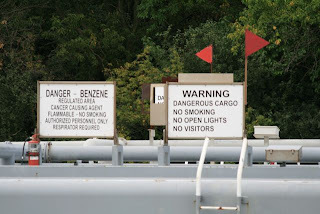 We've seen several barges carrying benzene. But here's the cool thing about tows: A single towboat and its barges can carry many, many times more cargo than a single rail car or truck. How much more? A typical tow, three barges wide and five barges long (that's 15 barges total) carries as much as two and three-quarters miles worth of freight cars . . . as much as 12 miles of tractor trailers, placed end to end on the interstate. How far can YOU go for $3.39? And tows are vastly more economical than trains or trucks. Indeed they're one of the most economical forms of transportation in existence. A tow pushing its load of barges consumes, on average, 2400 gallons of fuel a day . . . which works out to one gallon of fuel for each ton of cargo moved 500 miles. FedEx advertises that you should use its services "when you absolutely, positively need it tomorrow." But when there's no rush (and hey, it's not like petroleum is going to spoil or otherwise become less valuable during a long trip) a tow is the way to go--demonstrating the great, big, enormous power of slowness.